High Peaks Pure Earth has translated a blogpost by Woeser written on January 15, 2012 for the Tibetan service of Radio Free Asia and posted on her blog on March 27, 2012. This post is a follow up to last week’s “How Do We Get Out of This Predicament?”. 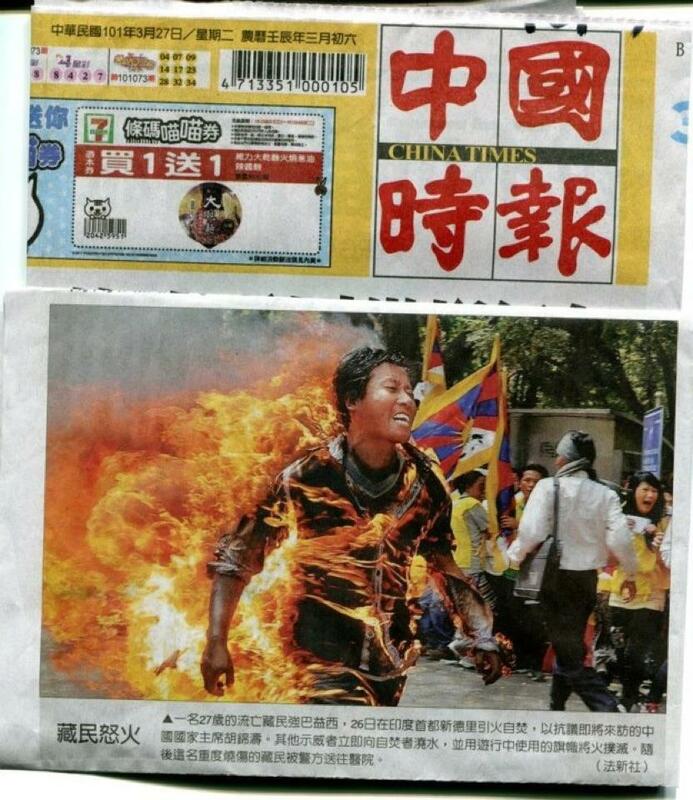 At the time of Woeser’s post, exile Tibetan Jamphel Yeshi had self-immolated in New Delhi but was still alive. Jamphel Yeshi passed away on March 28, 2012 and was cremated in Dharamsala on March 30, 2012. 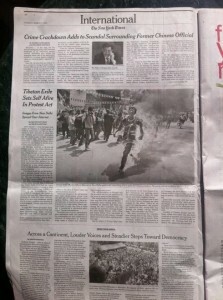 The photos show the New York Times and China Times reporting on the self-immolation of exile Tibetan Jamphel Yeshi on March 26 in New Delhi. Sustaining very serious injuries, he is currently in hospital receiving treatment, we can only pray for him. In my opinion, the way Tibet can break out of its predicament is by starting from village autonomy. Village autonomy does not refer to general questions of ethnicity in China, instead it is directed against mining, in favour of environmental protection and to protect the specific rights of religious activities; this interpretation helps to avoid opposition from nationalists, promotes the integration with and becomes a part of the Chinese civil rights movements, hereby obtaining wide-ranging support from the Chinese people. The Cantonese village Wukan serves as the latest model case. Villagers stood up together and put the local Party Secretary and Village Head to rout. Every household nominated a representative who then jointly elected a village council. This autonomous village council did not only make sure that the village affairs were dealt with in a neat and orderly manner, it also guaranteed that during times of oppression at the hands of the government and military police siege, villagers stayed calm and social order was maintained; finally, as a result of negotiations with the local authorities, it became what Hong Kong media praised as “the first case of a democratically elected village organisation that is officially recognised by the government”. At this point of the argument, I am convinced that someone will raise the commonly heard objection: what Han Chinese can do, Tibetans cannot, as they will be framed as and accused of splittism and thus oppressed… and so on and so forth. We have always been hearing these kinds of doubts, in fact, we have heard them for too long, too many times. One has to only use one sentence to reply: if one is not even afraid to self-immolate, what would one possibly be afraid of? The courage of an ethnic group will in this situation become the magic weapon of victory. In this context, the American Tibetologist Elliot Sperling calls into question the notion of “genuine autonomy”. He believes that the premise on which one could request the implementation of “genuine autonomy” is that the Chinese government admits that current “autonomy” is not genuine, which they will not do. And how can Tibet be granted “genuine autonomy” but not Xinjiang or Inner Mongolia? As long as there exists no international basic human rights, how can there exist “genuine autonomy”? As long as there is no freedom of speech, there cannot exist any “genuine” governmental structures. 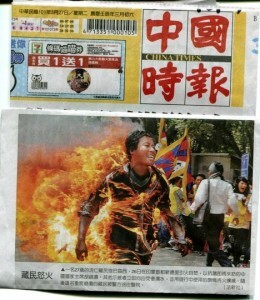 And if there did exist freedom of speech in Tibet, wouldn’t all other Chinese want the same kind of freedom? And the main difference is that the autonomy of Han Chinese townships will not bring about problems of ethnic nationalism. To this, Wang Lixiong replies: the kind of village autonomy he advocates does not need to be approved by anyone, it only needs the villagers’ own approval. Village level autonomy can be acquired by the villagers themselves. There is no need to always concentrate on single large-scale solutions, focus should instead be placed on present activities; if one advocates too ambitious goals, one will not know which direction to go in and there will be no result. As long as village autonomy is achieved, villages can join together and bring about township autonomy, and when townships join together, they can perhaps push for county autonomy… and once this stage is reached, there will be many other possible options. However, Elliot Sperling calls to attention that the issue of ethnicity in general has a direct effect on different forms of autonomy within Tibet, ethnic conflicts will be unavoidable. Tibetan and Han Chinese experiences of autonomy cannot simply be lumped together. 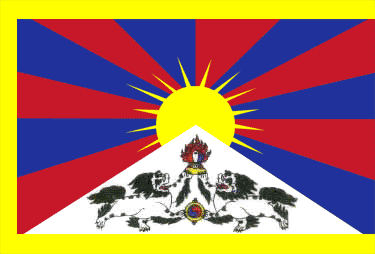 Further, if one includes freedom of speech, issues of Tibetan ethnic identity will inevitably emerge and controlling the identity of an entire ethnic group is very challenging, so not only will the central government not accept such autonomy, even a future democratic China will be reluctant to accept the request for Tibetan self-determination. Yet, Wang Lixiong is right in saying that starting from village level to achieve autonomy can mark the beginning of a new era of attempts. The problem lies in the fact that I believe that the Chinese government quite clearly sees where this path will lead to in the ethnic minority regions and hence, will try everything to prevent it. However, this once more leads us back to what Wang Lixiong said in his article, “the courage of an ethnic group will in this situation become the magic weapon of victory”. Some Tibetans have posted Wang Lixiong’s article on Facebook: this is perhaps a wise choice. After all, the holy land will not be reached in an instant, but requires a long tiresome journey.